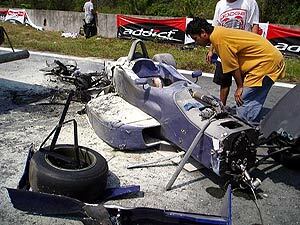 Konno, driving his JF3 Dallara 301, hit the wall on the exit of the 200kph kink before the last turn on his first lap of the second session of the day. 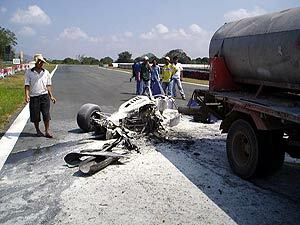 The car bounced off the wall ripping off the fuel rail which then caused the car to immediately catch fire. Konno was able to jump clear and was been taken to hospital for precautionary checks on his right leg. The hospital reports nothing is broken. The car was completely destroyed in the fire. Ironically Konnos team mate, Moreno Soeprapto,was forced to swipe the wall in avoidance of his crashing team mate suffering some suspension damage. This was Richard Josons first event as a team owner, rather than an owner-driver, and he reported So this is what it feels like to be a team owner, I shouldve stuck to driving! All at JF3 were relieved to hear Konno injuries were small. Practice for the day, this being the first day of official practice for the Addict Mobile Asian Formula Three Superprix, was abandoned in order that repairs could be made to the track, the asphalt having melted in the conflagration. The first session had seen Ananda Mikola set the pace with a 1m 23.9 lap followed by Dado Pena on 1m 24.2. John OHara was next with a 1m 25.4, Sy 1m 25.5, Avila and Jones 1m 25.8, Winslow 1m 26.5 and Marave 1m 27.3. The Promotion Class was headed by Greg Murphy with 1m 30.0, John Marcelo 1m 32.8, JP Tuason 1m 33.0, Enzo Pastor 1m 33.7, Morales 1m 34.0 and JP Carino on 1m 36.6. Konno and Soeprapto were running in freshly rebuilt engines and did not set times. There will now be five sessions on Friday.